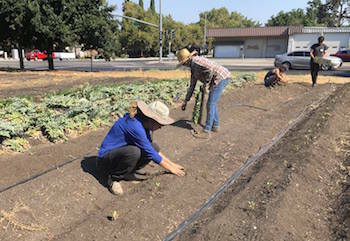 The West Sacramento Urban Farm Program leases city, school district, private and commercially-owned land for five years in the area’s food desert. Photo courtesy of West Sacramento Urban Farming Program. An urban farming project in West Sacramento, California, aims to fill the area’s food deserts with fresh produce and create new farmers in the process. Founded in 2014, the West Sacramento Urban Farm Program is an initiative of the agricultural education nonprofit Center for Land-Based Learning, headquartered in Winters, California. The program converts vacant lots in urban West Sacramento neighborhoods to increase food access, and support production of fresh fruits and vegetables. 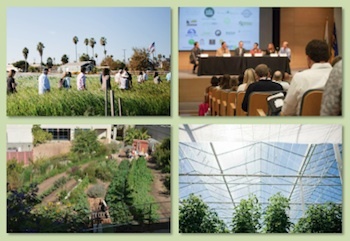 Less than TWO DAYS remain to obtain Early Bird discounted registration tickets for the upcoming Grow Local OC: Future of Urban Food Systems Conference presented by Seedstock in partnership with the OC Food Access Coalition. Scheduled for Nov. 10 – 11, 2016, at California State University, Fullerton (Hosted by U-ACRE), the conference will explore the community and economic development potential of fostering local food systems in cities. The benefits of community and school gardens, and more! The day will be anchored by a keynote address from Karen Ross, Secretary of the California Department of Food and Agriculture, on the importance of agriculture and local food systems in cities. Launching and running an economically viable urban farm is difficult under even the most favorable conditions. In Orange County, where land prices are at a premium and homes cannot be built quickly enough to fulfill resident demand, the prospect of finding available land and launching a profitable urban farming venture is viewed by many as remote and, at best, a very large challenge. To an entrepreneur, though, a very large challenge is often viewed as a big fat opportunity. Such is the case with Erik Cutter, a Laguna, CA local and entrepreneur with a background in biochemistry and oncology. In 2012, Cutter set out to not only sustainably grow nutrient rich produce, but also to demonstrate the economic viability of urban farming in Orange County. To do so, Cutter designed a farm comprised of 22 vertical hydroponic growing towers holding a total of 750 plants on a 260-square-foot plot in Laguna’s Bluebird Canyon. Cutter christened his urban microfarm, Alegria Fresh. He also built the microfarm to prove that you could use water efficient, environmentally friendly vertical hydroponic growing towers to create a high yield farming operation on a small plot of land, pretty much anywhere. Cutter says that microfarms are great for urban areas as they can be used to re-purpose existing sites–like abandoned lots–and can be placed on asphalt, on top of contaminated soil, or even on cement. “I actually prefer cement because it is weed free,” he says. In 2013, in order to expand his operation and educate community members and stakeholders, Cutter moved his farm to Irvine’s Great Park and set up his hydroponic vertical growing towers on a half-acre plot there. To complement the vertical growing towers and so that he could grow larger vegetables including squashes, kohlrabi, and beets for local consumers, Cutter incorporated an additional growing system, known as GardenSoxx. GardenSoxx are long, horizontal polypropylene mesh tubes that the farmer stuffs with his growing medium of choice–soil, compost, or coir. The farmer then inserts seeds, or seedlings, into the GardenSoxx, and applies nutrient-dense water. The GardenSoxx are beneficial in that they provide excellent drainage and aeration, thereby helping the plants get the oxygen they need to create strong root systems. Between its hydroponic vertical growing towers and GardenSoxx, the farm grows over 80 different types of nutrient dense produce including leafy greens, root vegetables and herbs. The farm sells to restaurants and direct to consumers onsite and through a CSA. These sales make the farm profitable enough to cover operational costs and provide a living wage for its staff. A trailer­load of happy kids show off their just picked strawberries during a tour of Irvine-based Tanaka Farms. Photo courtesy of Tanaka Farms. Tanaka Farms located in Irvine, CA, with its daily influx of visitors participating in educational farm tours and picking their own fruits and vegetables from its fields, has become a de facto family farm for all of Orange County. And, with production agriculture sadly on the wane in the county, farmer Glenn Tanaka is more than happy to offer community members county-wide the opportunity to engage in a unique family-oriented farm experience. The small farm’s resourcefulness, embrace of the broader community, and adoption of an agritourism-focused revenue model have enabled it to survive and thrive for four generations. The Tanaka family has a long history of farming in California, dating back to the 1920s when Kenny Tanaka’s great‑grandfather, Teruo, immigrated to California from Hiroshima, Japan and started farming in the Fresno area. In the mid-1940s, the Tanaka family moved to Orange County and the successive generations, including Kenny, his grandfather George and father Glenn, have been farming there ever since. Over four decades and up until his death in 1998, George Tanaka and his heirs ran a successful farming enterprise that at one point spread across 200 acres of leased Orange County land. The farm thrived, selling strawberries and vegetables to eager and loyal customers at a number of popular roadside farm stands. In the mid-1990s, however, urban development and rising land prices pushed the Tanaka’s to downsize. So in 1998, Glenn Tanaka signed a lease to relocate the farm to a piece of farmland that was in the process of being subdivided for the construction of a golf course. The tenant farmer occupying the land at that time, not wanting to downsize his operation to a smaller parcel on the site, did not sign a new lease. “Luckily, we came upon the place and we took it over at that point,” says Kenny. Piles of pumpkins greet visitors each October at the Tanaka Farm Pumpkin Patch next to Irvine’s Open Space Preserve. Photo courtesy of Tanaka Farms. Today, the farm offers local residents educational farm tours and pick-your-own produce opportunities (they grow some 60 different crops throughout the year). 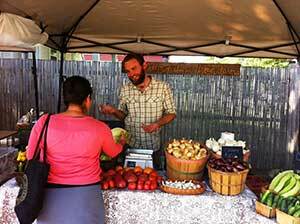 The Tanaka’s also operate an onsite farm stand and a CSA with a membership base of 450-500 subscribers. Today, amidst the urban sprawl and paved over groves and ranches of yore, Orange County residents might be surprised to learn that it is still possible to find cattle happily nibbling on grass and grazing the rolling pastures of 5 Bar Beef, a Silverado, CA-based ranching operation located in the Santa Ana Mountains. Residents can purchase 5 Bar Beef’s grass-fed, pasture-raised beef at several farmers’ markets in the county and online. 5 Bar Beef is something of a throwback, but the sustainable holistic grazing practices in use on the 800-acre ranch are entirely evidence-based — and Frank Fitzpatrick, owner and head cowboy in charge, believes that the techniques he uses offer hope for California’s water crisis and the planet at large. Grow Local OC: What made you decide to become a cattleman? Frank Fitzpatrick: On my eighth birthday, I decided I was going to be a cowboy, and I just never changed my mind. I went to Orange County High School and got into the ag department and Future Farmers of America and I liked it; in my senior year I had 25 steers, ten pigs and two sheep. I went to all the fairs. I went to Cal Poly for my bachelor of science degrees, one in agricultural business and one in animal science. I ran into Jan Bonsma. He was the head of the University of Pretoria ag school in South Africa; he had control of 30,000 head of cattle and had the resources to experiment, and he did. My other big mentor was Newt Wright. He was a cowboy who went to Cal Poly too. He was 17 years older; we were friends since I was about 15. More than anything else, what I learned from Jan and Newt was to think outside the box. Grow Local OC: How does 5 Bar Beef contribute to the growth of the local food system in Orange County? FF: I started selling half and whole cows in 2002, and in 2004, we started selling in the local farmers’ markets. We, sell to local food co-ops and some local restaurants, and we participate in the Bon Apetit Farm to Fork Program. We are the only beef producer in Orange County that sells in Orange County. And we’re among only a handful of ranches in California that produce meat from conception to your plate. Grow Local OC: How does 5 Bar Beef raise its cattle differently from other operations? FF: We just turn ‘em out; they are born outside and die outside. So a 3-year-old has been in a corral maybe six times, total; commercially raised cattle are surrounded by wood and pipe 24/7. Our herd and our land are completely chemical-free; holistic management eliminates the need for a lot of stressors like castration, worming, and dehorning. And they taste like beef. I mean, this stuff is just to die for. What they sell in the commercial beef industry is actually just veal; the animals haven’t lived long enough to taste good, so they rely on fat for the flavor. The average commercial animal is harvested at 12 to 14 months. Ours are two or three years old, mostly three. Grow Local OC: Why did you choose to feed your cattle grass and raise them on pasture? FF: My first major revelation hit when I was taking a nutrition class and doing the math and found that it took 32 pounds of grain to make a pound of lean protein. That seemed ridiculously inefficient. You buy fossil fuel, run tractors over and over the land, irrigate, harvest, silo it, crack it, steam it, roll it, cook it. Why in the hell would you do all that work when the cow can walk out there and eat in the field? Grow Local OC: Isn’t that equation often cited by environmentalists as a big reason people should eat less meat? That and methane? FF: The earth supported predators and herds for the last fifteen million years. Humans took the predators out of the equation because we’re afraid of them, but the predators moved the herds, and that kept the environmental cycle healthy. That’s what we need to replicate, one ranch at a time; that’s how God ran buffalo 250 years ago, on a sea of grass. I’ve had my herd of Barzona cattle since 1979, and in the late 80s I ran into Allan Savory. He’s a pioneer of rotational grazing methods, holistic management, that can stop desertification and climate change. With proper grazing, you can set up a cycle that gives the environmentally desirable perennials a better chance to survive and thrive. Grow Local OC: So do you find it economically feasible to ranch this way? FF: Producing beef the way we do is marginally viable in a drought situation. We’ve owned our herd of cattle for 37 years, and these periods of marginal economic viability […] have to be lived through and sustained. The situation of limited grazing in Orange County could be reversed by cooperation by local environmentalists that control vast areas of land in the county that have been traditionally used for grazing. There’s a belief that cows are causing global warming, when if you take a wider view, cows are part of the solution. The land is visibly deteriorating since the cattle were removed 12 or 13 years ago…I would like the opportunity to reverse this land degradation with holistic planned grazing. A member of Slow Food USA, Slow Food Orange County aids in the establishment of school and community gardens, fosters food-centered education and camaraderie, and highlights those who promote Slow Food principles. In keeping with the principles, Slow Food Orange County works toward the establishment of a food system that is fresh, seasonal and local; healthy and nutritious; fair to its producers; and accessible to everyone. Gardening is one of Slow Food Orange County’s primary focus areas. So when steering committee chair Jeremy Samson moved to Anaheim a few years ago, he was surprised to by the city’s dearth of public gardens. “In 2012 there were no community gardens in Anaheim,” says Samson, who grew up in Maine and is well-versed in Slow Food culture. Whether you are new to the local food scene, or you’ve been buying from your neighborhood farmers market for years, you’re making a big difference in the lives of small farmers and food distributors. But the food system is complicated. It’s not always clear how to spend your resources—whether to invest time or money—to best support your local food system. So we’ve compiled six tips to make it even easier for you to support local food producers. Farmers markets aren’t a new thing, but they have become much more visible and plentiful in many areas in recent years. Variety is the spice of life, so don’t limit yourself to staples you’ve eaten a thousand times. Farmers at the markets offer a diversity of fruits and vegetables and often provide recipes, or share easy ways to prepare foods with which you may not be so familiar. Who better to put in charge of creating healthy school lunch menu options than the students themselves. It might sound crazy to some, but eager Orange County high school students are taking on this challenge by participating in Cooking Up Change, an annual national culinary competition in which teams of student chefs strive to concoct healthy and delicious school meals. The program is part of the Healthy Schools Campaign and winning high school teams qualify for the national contest in Washington, D.C. In Orange County the program is managed by Kid Healthy, an organization that focuses on reducing childhood obesity and promoting healthy diets.